The UK Atomic Energy Authority have created temperatures hotter than the Sun inside two buildings here on Earth. 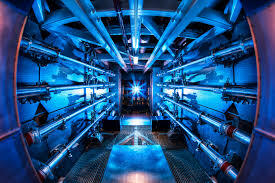 They are trying to create stars on Earth to reproduce the nuclear forces at work in the sun. They will use these forces to run Power Stations and the fuel will come from mostly from sea-water and will be virtually unlimited. But when and, if it's so good, why haven't we done it yet?